Simple by design, the Swift FX has been reduced to a sleek, minimal interface that is lightweight and easy to fit. Changes from the Swift™ LT can be seen on the headgear, pillow cushion, and frame. Swift FX Headgear is not included. Calling the Swift™ FX 'minimal' is not a fair description. The mask's frame is practically invisible with the pillow cushion connecting seamlessly with the rest of the mask. A set of "lock and key" quick-release tabs secure the silicone headgear straps and allow for easy removal from the frame. The minimal design creates an ergonomic comfort and allows for reading or watching TV at bedtime, even with glasses on. The Swift™ FX nasal pillows are designed with dual-wall flaps with improved for better support and comfort. The cushion's base is outfitted with an integrated flexible chamber that provides stability for side sleepers. 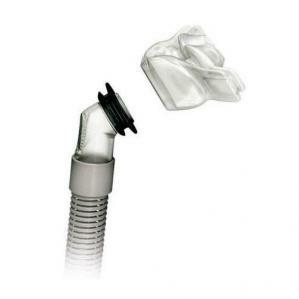 This added flexibility accommodates movement and a reliable seal at high therapy pressures. The Swift™ FX has been tested up to 20cm of water pressure and can maintain a consistent seal even at maximum therapy. It is recommended to clean your CPAP Mask daily with warm water and mild detergent. Be sure to rinse thoroughly and lay flat to dry before use.